The gray whale was once called "devil fish" because of its fighting behavior when hunted. It can reach 49 feet and weigh at least 36 tons. 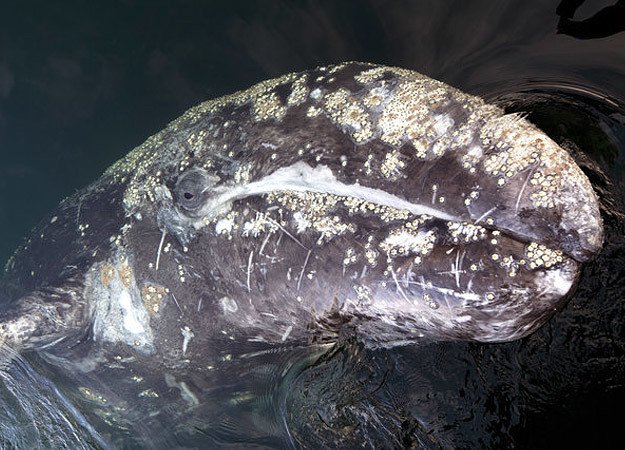 Distinguished by gray patches and white mottling on its dark skin, the gray whale is fairly common along the Pacific Coast of North America, where it migrates between feeding and breeding grounds. In early May, gray whales appear offshore of the Aleutian Islands after migrating north from Pacific lagoons along the Baja Peninsula in northwest Mexico. Killer whales lie in wait for their calves in narrow bottlenecks between the islands. A mother goes to great lengths to protect her calf, but the orcas will attack for hours and hours until she's exhausted. Once separated from her side, the calf is drowned.